The authors also observed that heterozygosity among Ashkenazi Jews is higher than in European Americans. This is fairly conclusive evidence that Ashkenazi Jews are not so distinctive because they passed through a genetic bottleneck that shifted their allele frequencies in a direction specific to their group. On the other hand, the conclusion that the genetic distinctness of Ashkenazi Jews is due to Middle Eastern ancestry is not demonstrated by this study. For example, the Uyghur of Central Asia are distinct from both East Asians and Caucasoids, but this is not due to any mysterious "Central Asian" component in them, but rather due to the fact that they are an admixed population of Caucasoids and Mongoloids. To demonstrate the specific Middle Eastern background of Ashkenazi Jews, it would be a good idea to also study other Jewish groups. If it is shown that the various Jewish groups possess a common autosomal genetic component, then the simplest explanation would be that this component stems from the ancestral Jewish population of the 1st millennium AD, prior to the separation of the various Jewish groups from each other. Moreover, the genetic distinctiveness of Ashkenazi Jews does not in itself say anything about the extent of Middle Eastern ancestry in this group. For example, in this paper, the Middle Eastern groups (mostly non-Jewish Semitic groups recruited in Israel) were different from other Caucasoids by the possession of a specific ancestral component (color-coded brown), but the extent of this component differed among them. With that said, I do suspect that the distinctiveness of the Ashkenazi Jews is in part due to the possession of a Middle Eastern component of unspecified strength. I base this hypothesis on the results reported to me about the EURO-DNA-CALC test. This test distinguishes between NW, SE Europeans and Ashkenazi Jews; a few Arab individuals who have communicated their results to me have reported fairly high AJ components, indicating that part of what distinguishes an AJ from Europeans is related to the Middle Eastern Semitic background of that group. The way forward is of course to perform a comprehensive admixture analysis where Europeans, various Jewish groups, and various non-Jewish Middle Eastern groups will be represented. That is the only way to ascertain the ancestral components of the various Jewish groups. Moreover, such an analysis would establish the extent of the common genomic element between the various Jewish groups, which -so far- has been established for a limited number of Y-chromosome and mtDNA lineages. UPDATE: While a formal admixture analysis is not performed, the EIGENSOFT plot is suggestive of what common sense would dictate, namely that Ashkenazi Jews (reds) are intermediate between a native Near Eastern group (the Druze) and Europeans. Unfortunately the inclusion of the Mozabites (off the chart to the left) who have substantial Sub-Saharan ancestry, makes the resolution of the visible part of the chart less than desirable. Anna C Need et al. It was recently shown that the genetic distinction between self-identified Ashkenazi Jewish and non-Jewish individuals is a prominent component of genome-wide patterns of genetic variation in European Americans. No study however has yet assessed how accurately self-identified (Ashkenazi) Jewish ancestry can be inferred from genomic information, nor whether the degree of Jewish ancestry can be inferred among individuals with fewer than four Jewish grandparents. 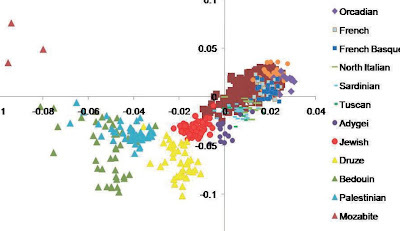 Using a principal components analysis, we found that the individuals with full Jewish ancestry formed a clearly distinct cluster from those individuals with no Jewish ancestry. Using the position on the first principal component axis, every single individual with self-reported full Jewish ancestry had a higher score than any individual with no Jewish ancestry. Here we show that within Americans of European ancestry there is a perfect genetic corollary of Jewish ancestry which, in principle, would permit near perfect genetic inference of Ashkenazi Jewish ancestry. In fact, even subjects with a single Jewish grandparent can be statistically distinguished from those without Jewish ancestry. We also found that subjects with Jewish ancestry were slightly more heterozygous than the subjects with no Jewish ancestry, suggesting that the genetic distinction between Jews and non-Jews may be more attributable to a Near-Eastern origin for Jewish populations than to population bottlenecks. Dienekes, tell Miss Ann C Need she explains my 23% of Ashkenazi ancestry with more than one million documented Tuscan ancestors. Ashkenazim are there in the plot exactly because they are a mixture of Europeans and Middle Eastern ancestors. I see they are closer to Europeans than Middle Eastern ones and with Tuscans (and Italians)are arm to arm. Very nice meditation that I fully share, Dienekes. In the PC graph (while interesting and rather suggesting your admixture hypothesis) I miss samples of Balcanic, Antolian and maybe other peoples of the Black Sea area. On first sight AJs seem like the would fully overlap with Turks or Balcanic peoples and the closest group are anyhow the Adygei (what happened to the theory that AJs are partly descendant from Khazars?) but this can't be fully confirmed for lack of sampling in all that area. I have suggested more than once that the "European" admixture of most modern Jews (probably not only Askenazi but specially these) may come from Roman times, when most Jews in the world lived not in Palestine but in Asia Minor (this even before the Roman-made genocide, as the diaspora was mainly caused by economic reasons). This Jewry of Anatolia (and other places but specially that one) was central in the formation of Christianism but also in the formation of modern ethnic Jews, who later spread all areound Europe and the Mediterranean (in some cases admixing even further). So I would strongly suggest to look for comparable samples in that area of the Black Sea too and specially in Turkey. The same Goldstein writes: “Secondly, the Jewish cluster lies approximately midway between the European and the Middle Eastern clusters, implying that the Ashkenazi Jews may contain mixed ancestry from these two regions. This is consistent with the Y chromosome and mtDNA genetic evidence which has been interpreted by some to suggest a stronger paternal genetic heritage of Jewish populations from the Middle East and stronger maternal genetic heritage from the host populations of the Diaspora”. Perhaps this satisfies the Semitic male proud, but, as a true Jew is who has a Jewish mother, then no Jew is a Jew. It will be demonstrated that also Jewish men have probably a little bit to do with Abraham. To Maju I can say that after I demonstrated that the “Jewish” mother of an Italo-American, my friend, is indisputably of “Khazarian” origin, at FTDNA they say that only the Khazarian upper class converted to Judaism: the Ashini. Ridicolous. I would have liked to see Kurds included, as ancient Israelites were probably admixed themselves, IMO Kurdish on the male side, and Caananite on the female side. Wasn't it Ellen Levy Coffman who prooved that Askenazi Levites were of Khazar origin - i.e. those with the name LEVI. Ellen Levi Coffman is a reasonable Jewess, one of the few person I have maintained some contact after my two banishments from Rootsweb and "forums-dna". She has always been critical about all these sponsorised papers. The theory of the presence of some Khazarian mtDNA in the Jews I think is due to FTDNA, in its Sephardic project. Ellen is too smart for doing a similar hotchpotch and I communicated to her my finding and she didn't know anything on it. "ancient Israelites were probably admixed themselves". For sure. For a start the two main Y-haps are versions of J and E. Separate origins obviously. "It will be demonstrated that also Jewish men have probably a little bit to do with Abraham". So which of these two Y-haps did Abraham have? Having E and J doesn't mean to have a Middle Eastern origin. There were E and J from ancient times also in Europe and many Jewish E and J can come from there. Read what Ellen Levi Coffmann writes on Rootsweb: now she too is thinking to a Middle Eastern origin of Jewish mtDNA. My theory is that those mitochondrial (K, N, etc.) came from the Italian Refugium. See a post of mine on mtDNA N1b. Not everyhing comes from Orient. Abraham would have needed 3 Y chromosomes: one for J2, one for J1 and one for E.
I am reading a book by Israel Finkelstein right now. He seems to point at the fact Israelis were much more mixed from the very "start". In fact he would have needed many more, as these haplogroups are all definitively much much older than the putative time when Abraham may have lived (3000, 2000 BCE? ), so "he" would have needed to have almost a different haplogroup in each sperm cell. Even the "Cohen haplotype" is spread across two distinct large haplogroups: J1 and J2. Hard to swallow, really. Something seems to be missing from the data. There is talk about the genetic relatedness of Jews with Italians and some Middle Eastern groups, and surely the relationship is there, as Jews and many Southern Europeans have Middle Eastern roots, in addition to the mixture between Jews and Southeast Europeans during the Roman empire. I've encountered too many very pale-skinned, Nordic-looking Jews to be satisfied with what I see so far. Perhaps over time Jews began to look more and more White because, for one reason or another, White-looking Jews were preferred or had more opportunities to reproduce, as Kevin MacDonald has hypothesized. This would leave their Middle Eastern component largely intact. In any case, Jews are a group with an enigmatic quality. Their level of in-group solidarity is unmatched; their empathy with the downtrodden of other ethnic groups, while misguided, is sincere; and their psychological intensity is breathtaking. They are also the most intelligent people in the world (their intellectual output speaks for itself -- roughly 25% of the books I read are authored by Jews). Their social and psychological characteristics are much more interesting than the genetic data, though the genetic data may shed light on it. They are too diverse-looking to be declared a "race," though they share strong genetic roots, regardless of what part of the world they are from. "Jews and many Southern Europeans have Middle Eastern roots, in addition to the mixture between Jews and Southeast Europeans during the Roman empire." I'm not sure what your definition of "roots" is, but yes, Jews have Middle Eastern roots; any elements in Southern Europe that originated in the Levant, from a phenotypic/ genetic standpoint however, have been confirmed to be overwhelmingly of prehistoric origin (the same goes for the rest of Europe). Southeast Europe is defined as being Greece and the Balkans...and the people from there don't have Jewish roots or ancestry, but some Balkan countries such as Romania did contribute to the DNA of Jews – not the other way around though. If you're referring to Anatolia, then that region was and always has been in Asia Minor, even though it once was Hellenic territory. Middle Easterners have had little genetic influence in/on the European continent however. Even though the Jews probably did acquire some European elements from Anatolia, they were by far and large acquired mostly from Central Europe, the former USSR and Poland rather than Southern Europe or Anatolia. The relatedness that you mention there is between Southern Europeans and Jews is simply (pre) historic...nothing else. Even Sephardic Jews who may have some Southern European DNA, would have far less of a European component than any Ashkenazi’s would, and Ashkenazis aren't particularly known to have Southern European ancestry. That is not what autosomal studies of Askenazis (where should I put the "h" in that word? Can't recall) show. They do have some North/East European ancestry but the bulk looks Greek or Armenian. True that Bauchet only sampled Finns and Poles in Eastern Europe (not too eastern) but the indirect comparison with other studies suggests that they would look "diluted Greeks" or "Turks" anyhow. No. The bulk of modern day Jews comes from a long period of residence (many many generations) in Asia Minor, in a time when even Rabbinic Judaism (still forming) was proselitist (not to mention the diffuse line between them and early Christians). They appear Anatolian or Balcanic by genetics and they look rather different than West Asian peoples, including Lebanese Christians. The whole idea of a Jewish origin in Palestine (and even more of a race kep pure through milennia) is largely a myth. Most have only a slim connection with that area probably. So it's just logical that Sephardites are less European, and specifically less Northern European. This doesn't mean they are more purely Jewish in the sense of Jewish from the year 1 CE. They are more Mediterranean but largely in a cosmopolitan sense. and Ashkenazis aren't particularly known to have Southern European ancestry. "They do have some North/East European ancestry but the bulk looks Greek or Armenian. True that Bauchet only sampled Finns and Poles in Eastern Europe (not too eastern) but the indirect comparison with other studies suggests that they would look "diluted Greeks" or "Turks" anyhow." I stand corrected over the North/Eastern European contribution to Jews. Well Armenia was part of the enormous former USSR and Jews have had a very long presence in Armenia. I think the third paragraph that you replied to might have been misinterpreted - I didn't phrase it really well. What I was trying to point out to The Sangha (taking into account the presumably varied West Asian components in Jews) is that these components in their modern West Asian sense have not contributed to Southern Europe (Iberia, Italy, Greece) at any significant level AFAIK i.e. any lineages specific only to Jews have not transpired in Europe and those lineages that both groups share (Y-DNA haplogroup J & some of its subclades, Y-DNA E etc.) would have to be derived (in Europe specifically) from pre-historic times. I do however acknowledge that Southern Europeans may well have contributed to the lineages of Ashkenazi's which I didn't deny and I know the Sephardim originated in Iberia, so obviously they would have some European specific lineages - but presumably mostly only Iberian. It was just merely an observation that the Sephardim don't seem particularly as "European" as the Ashkenazi’s. Having said the above, I imagine that any “Jewish” contribution in Europe or to European Americans would be tricky to evaluate/determine…unless it’s already known for sure that an individual already has Jewish ancestry. No doubt the “Jewish” DNA would most likely only show up exaggerated or as different/recent West Asian specific lineages/subclades etc. in Europeans. I have yet to hear of a study proclaiming a “Jewish” contribution to Southern Europeans, since that’s what The Sangha seemed to be insinuating. For sure they are not pure repesentatives of that area, but it can't be denied that they are at least partially associated with that area (even genetically). ... I imagine that any “Jewish” contribution in Europe or to European Americans would be tricky to evaluate/determine…unless it’s already known for sure that an individual already has Jewish ancestry. No doubt the “Jewish” DNA would most likely only show up exaggerated or as different/recent West Asian specific lineages/subclades etc. in Europeans. Or even as Balcanic or Spanish or Eastern European (Khazar). It would be virtually impossible to determine, indeed. First, whatever West Asian ancestry would be candidate for any other historical or prehistorical source (Phoenicians, Neolithic waves, Arabs, even Greeks...) and second we really don't have any good idea how was the DNA of Jews in the Roman Age. We only know how does Jewish DNA look now after two milennia. I imagine it shouldbe the case to some extent but AFAIK it has not been substantially demonstrated so far. By the moment most of what I have read is comparisons with Europeans or people of European ancestry in the USA. These have discarded to some extent a massive Northern European ancestry but for the rest little has been researched or demonstrated. It would seem that, against the formal rule of maternal transmission, Jewishness has been mostly transmitted in fact via the fathers (no surprise in such patriarchal culture). They do seem to have a clear dominance of likely West Asian paternal lineages. But the studies on mtDNA did not shed any light in favor of a West Asian ancestry by the mothers' side (actually in many cases it looked the opposite: native local ancestry) and autosomal DNA studies like this one are not really conclusive yet, mostly because the comparison with possible ancestors like Anatolians, Southern Russians and a sufficient variety of West Asian and Balcanic peoples has not been explored properly. Additionally most of these studies seem focused only in Askhenazis, who are obviously just a fraction of all Jews. I would thnk that in order to determine what genetic markers may be most genuinely Jewish a good comparison of all those Jewish peoples (or at least all those that are not mainly converts from other ethnic groups) should be done. Sadly there is also a political component in this matter, because sustaining the myth that Jews are "the true original inhabitants of Palestine" is an important part of the Zionist ideology, while disproving it would be a substanial blow to the ideology and myths that pretend to legitimate Israel. Hence that much research has avoided to do a true clarifying study on this subject. (Not to mention how they persecuted Prof. Arnaiz-Villena for an apparent error that appeared to show a direct link between Palestinians and Jews. These kind of academic bullying may also hinder impartial research). "Sadly there is also a political component in this matter, because sustaining the myth that Jews are "the true original inhabitants of Palestine" is an important part of the Zionist ideology"
Yes it is a significant political subject indeed. "(Not to mention how they persecuted Prof. Arnaiz-Villena for an apparent error that appeared to show a direct link between Palestinians and Jews. These kind of academic bullying may also hinder impartial research)." I would say it does hinder impartial research - since unbiased research is undoubtedly crucial to finding out the truth on certain subjects. There is indeed political motivation in the academic world – I remember “researchers” from FYRO Macedonia were making false claims about the Greeks. That kind of thing really infuriates me because I know that genetic research is a legitimate form of science, but when they push their own agendas it’s just not right. Of course there will be academic errors, but I assume mistakes can actually lead to more informative information than previously thought and it is a shame they have to be so careful where to tread. It's always those certain sects with a common perception or false idea (including some researchers) who are confronted with something politically, religiously or socially significant that they don’t like (something that debunks a perception or myth), that they then try to counter that evidence by making things up or by obscuring legitimate research. This kind of widespread mentality just creates obstacles and skews things for genuine researchers. It's interesting that most studies stress the differences between individual groups of widely geographically spread Jews with their immediate neighbours. But one would expect Jews as a whole must have come from somewhere although we know that they do not all descend from just a single man called Abraham. It's even doubtful that such an individual existed in any way other than the way Maui did for example. Can anyone tell us which populations Jews are closest to? Or does anyone know what the actual gentic differences are between Palestinians and Israelis? As for Y-DNA, the Wikipedia entry on Palestinian people has a good (referenced) summary: J1 is the haplogroup most strictly associated with Semitic peoples and is strongest among Palestinians and Negev Bedouins (both arguably descendant from Natufians). J1 includes several related modal haplotypes like Galillean Arab, Moroccan Arab and Cohen. Jews instead have less J1 and much more J2 (almost double). J2 is more related to Greeks (and other Eastern Mediterranean peoples). And a Y-DNA affinity between Jews and Anatolian peoples (Turks, Kurds, Armenians) has been estabilished by Nebel. As for mtDNA maybe check Behar et al, 2008. While there is no comparison with Palestinians or other peoples (except Druzes, whom Behar mythifies as representatives of the ancient Levantine lineages against all common sense), many of the lineages seem obviously non-Levantine but rather from other populations (Behar argues for founder effects but his reasoning is, IMO, ideological, not empirical). Thanks Maju. That mix of J1 and J2 is especially interesting. And the Caucasus/Zagros element. Seems Jews are even more genetically mixed than I'd previously thought. Do you know the proportion of Y-hap E in both groups? Do you know the proportion of Y-hap E in both groups? Maybe it helps. Next time DIY. According to this paper Palestinians have 10% E-M78, split between E-V22 (7%) and E-V13 (3%). Instead Druzes are all 10% E-V13 (they again look European). E-V22 again appears high among Moroccan Arabs (like J1) but the highest frequencies for this clade are towards the Nile, among Egyptian Berbers, Ethiopians and Nilotics. In Europe E-V22 is most common in NW Iberia. There's no data for Jewish, except Moroccan ones who are also high in E-V22. And Ethiopian Jews who are lacking either clade (high in E-V32). I'm a bit late here, but would like to add that full Jewish people are indeed easy to separate from non Jewish people and even half Jewish people. I read that in a Discover Magazine article quoting some studies. Once you get down to being a quarter or a fifth Jewish, you should begin to group with Europeans. I don't mean to talk about myself, but would like to use myself as an example of what happens to someone who shows up Italian and Jewish on ancestry. I'm northern Italian and I also show up with a quarter Jewish Ashkenazi ancestry. On deep ancestry genetic testing, I come out being Greek and Tuscan. My percentage of Middle Eastern isn't any higher or lower than any other northern Italian and my northern European component is the same as a northern Italian and a Greek. Greeks and Tuscans, according to Genographic are about the same mixture of southern Euro, northern Euro and old southwest Asian ancestry. Whether or not Jewish people mixed with Italians, I find it odd that any genetic site should be able to show less than one quarter Jewish ancestry. At one eighth and you should group with the rest of Europe. Whether or not my ancestry is pure, on deep ancestry I was Greek first and then Tuscan, even if my family is from very northern Italy for eons. That tells me I do indeed have some Jewish ancestry that is heavily Greco-Roman and not Khazar. I wouldn't put much into genetic sites that try to predict Ashkenazi ancestry. Only if you are half or full Jewish will you stand out from Europeans. Less than that and their deep ancestry comes through as a mix of Greco-Roman, southwest Asian and northern European. In my case, I was no more or less than other Italians and Greeks. In the end, perhaps we are our deep ancestry and so are Jewish people. They are mostly Europeans and West Asians who inbred and had bottlenecks in Europe. Once mixed with others, that bottleneck breaks up and long chains of identical DNA code gets broken up and they start to look more like Europeans if mixed with other Europeans. Genetic remains a political Propaganda stuff I don't "believe" in...Science is Not a belief question !